Expertly upholstered in beige fabric and detailed with elegant nail heads, the Enlightenment Bed by Zuo is the perfect complement to your bedroom. Available in queen or king size, create a comfy and relaxing look with only a mattress and the frame. Winged back and sideboards are upholstered for a clean and sophisticated look. What is the fabric made of? What are details on the slats (size, type of wood ) and how far apart are they? 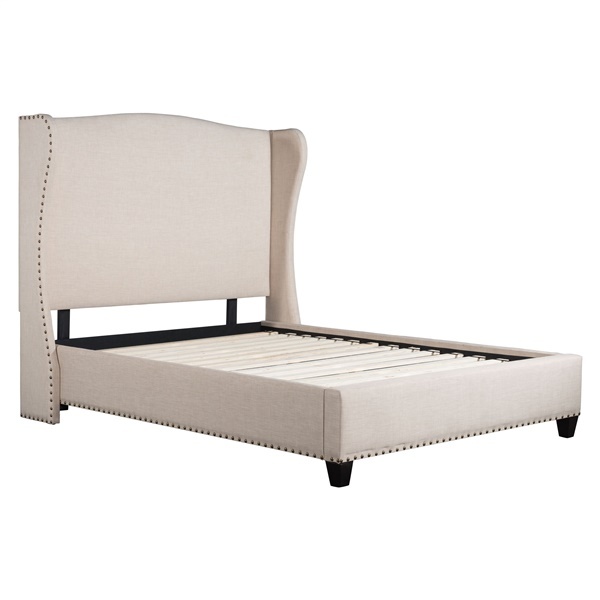 The Enlightenment Bed is upholstered in a polyester-linen blend material. The slats are made of solid pine wood, and are about 2.5" wide. The space between the slats is about 3 inches.